I’m excited to share a first look at the highlights from Jared’s Bar Mitzvah video. As mentioned in a previous post, the event took place on Saturday, April 2nd and we were fortunate enough to be able to cover both the service and the party. Friends and family gathered first at Universalist Society in Franklin that morning and then came back in full force to the DoubleTree in Westborough in the evening. This video kicks off with all of the energy of Jared’s introduction and takes it from there. Between the games, contests and great dance music, kids and grown-up’s alike were non-stop all night. One of the DJ’s actually told me this was definitely one of the most enthusiastic groups they had ever worked with. With Jared’s brother Alex having his Bar Mitzvah in December 2017, I anticipate another big celebration on the horizon. Jared worked super hard for this day and the event was a perfect reflection of this special occasion! 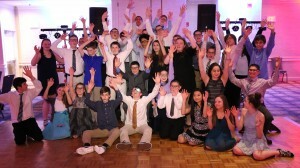 Jared’s Bar Mitzvah – Sneak Preview from Video by Jamie on Vimeo.